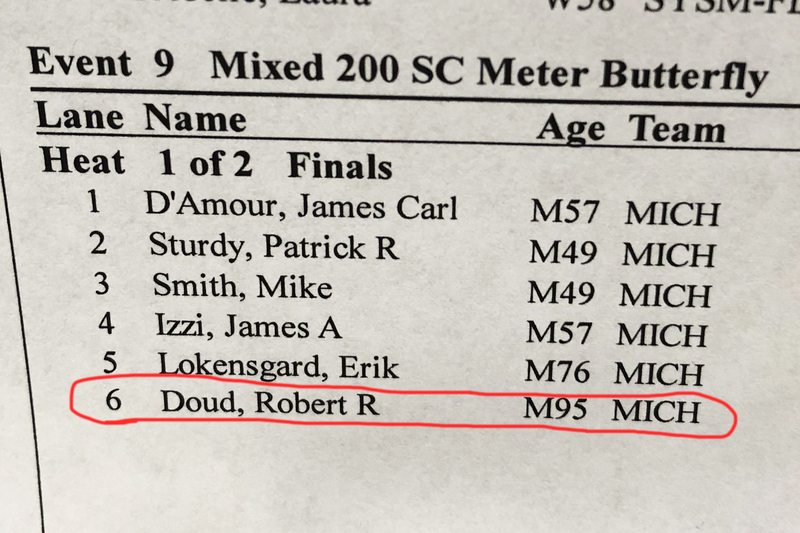 At 95 Years Old, Robert Doud breaks the World Record in the 200m, 100m, 50m Butterfly! In his first U.S. Masters Swimming meet aging up to the 95-99 age-group, he is the first masters swimmer in history to swim a 200m Short Course Fly in a time of 11:08.68. At the Milford Meltdown SCM meet on 3-17-2018 his split at the 100 mark from that race broke the existing World Record of 6:04.41 with a time of 5:38.32. Later in the meet he swam the 100 Fly event in 5:36.58 to break his split World Record. 3 World Records in one meet and these are the first World Records Bob has ever swam in his life! Absolutely amazing! It’s so inspiring to see and we wish Robert more world records! !